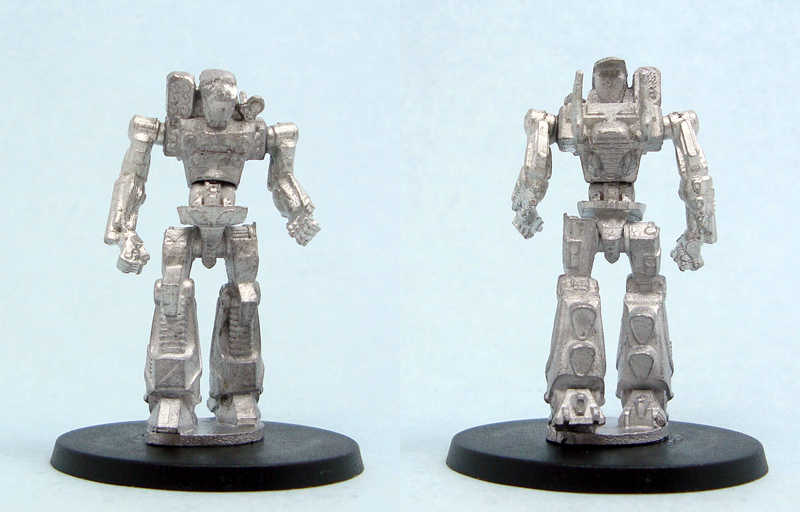 As part of my Pacific Rim project (see previous posts) I ordered some mechs from Reaper Miniatures‘ CAV line. They were such nice models that I figured I’d review them for the benefit of other hobbyists as well. By way of disclaimer I have to say that I know nothing about the CAV: Strike Operations game, so I’ll be reviewing these purely from a “giant robots to be used in Pacific Rim style gaming” point of view. I’ll happily take the liberty of interpreting the designs as I view them, so vents might become guns and so on! 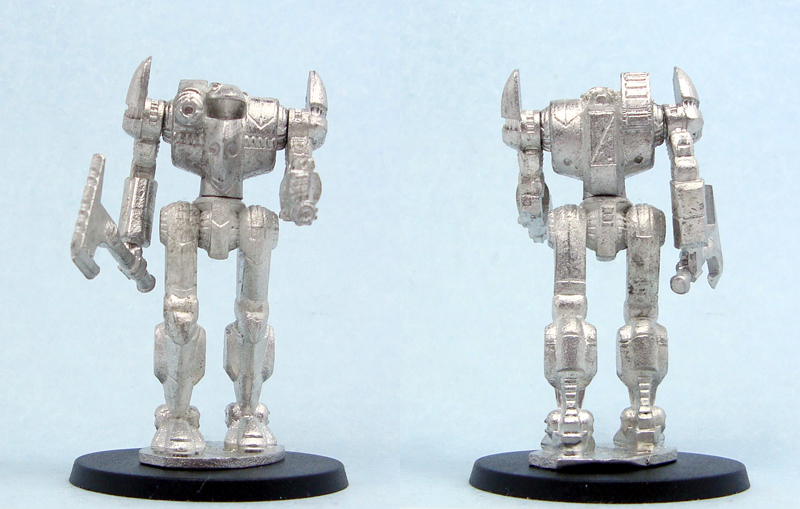 All the miniatures are sculpted by Chris Lewis, and have integral metal bases. I’ve glued them to 40mm plastic bases. 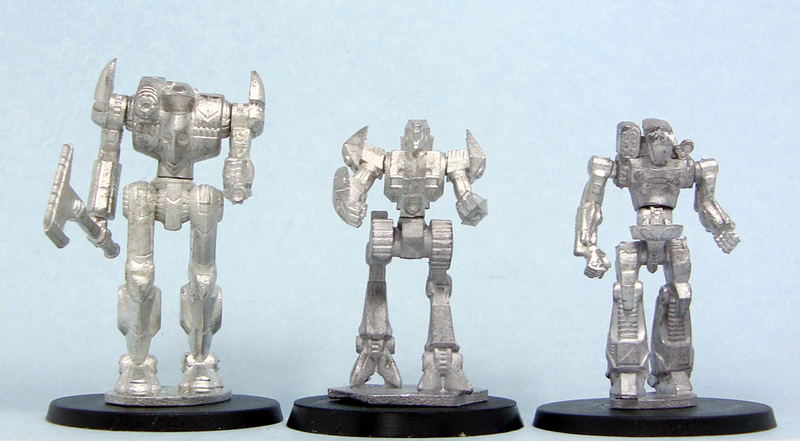 There were no major casting issues, only minor mould lines and very little flash on some models. All except one of the models are four part castings consisting of torso, legs and two arms. The parts fit together nicely on all the models. You can find all the miniatures in Reaper’s online store. Prices are from approximately 7.50 EUR to 8.30 EUR. Hawk has a strong Transformers vibe, mostly due to the chest reminiscent of Optimus Prime. Hawk stands at around 49mm from the bottom of his soles to the tips of the things on his back. 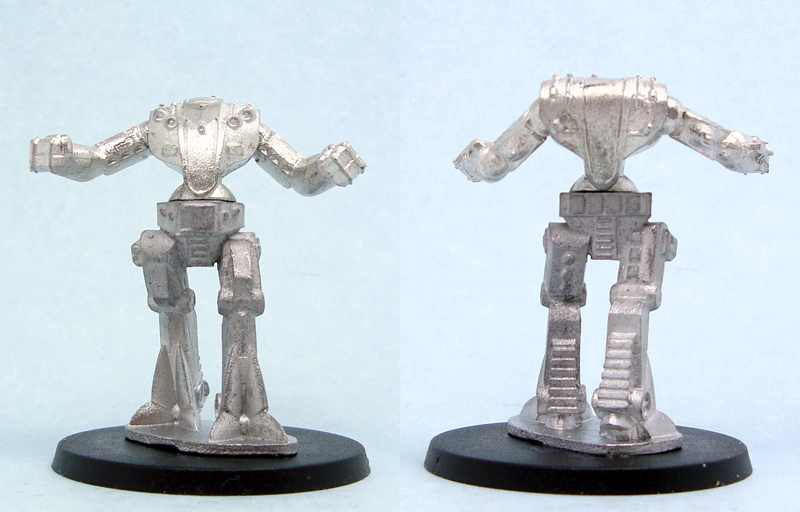 I’m not entirely sure what they are, although their design and the mech’s name suggest some sort of jet engines. They might be weapons, too. Anyone more familiar with the game, feel free to comment! Hawk’s smallis stature made me put it on a washer to give him a slight height boost. Of all the models in this review, Hawk might be my least favourite one – it’s just a bit boring. Hawk is the exception to the “models come in four parts” rule, as his back..things add an extra two parts. If Hawk was Transformers, Spitfire is Gundam. With sharp edges, reverse jointed legs and sloping armour, this one is the most high tech looking of the selection, and the first word that springs to mind is “sleek”. Spitfire isn’t too tall, standing at approximately 47mm from the bottom of his soles to the top of its head. This is a lovely, lovely design, and one of my favourites. Spitfire’s bracers have hollows that I envision as weapon barrels or housings for retractable weapons. The first impression I got from Hemi was “lanky”. With a fairly short torso and long legs, it reminds me of an ent from the LotR movies. Of course this ent is metal and has a pod of six rockets on the right shoulder, which makes a slight difference. There are also four barrels/vents on its chest, a searchlight on the left shoulder and two fins on its back. There’s something very menacing and purposeful in the design. 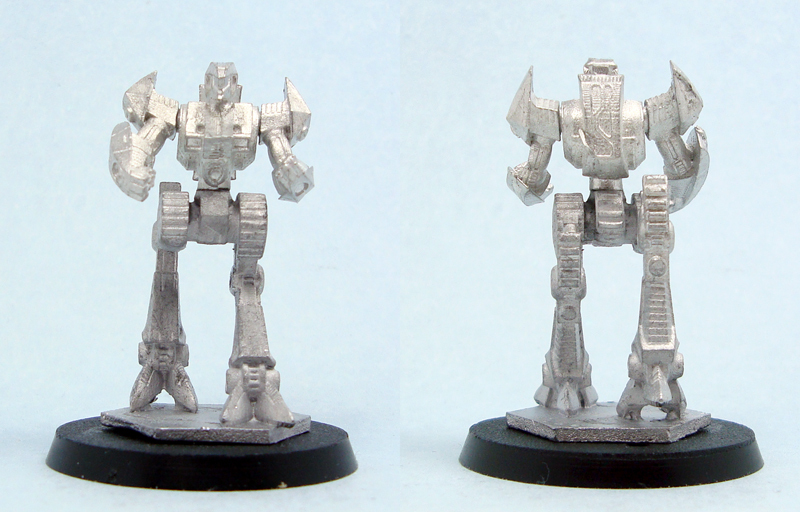 Hemi is roughly 46mm tall. Dauntless might be my favourite of the lot. 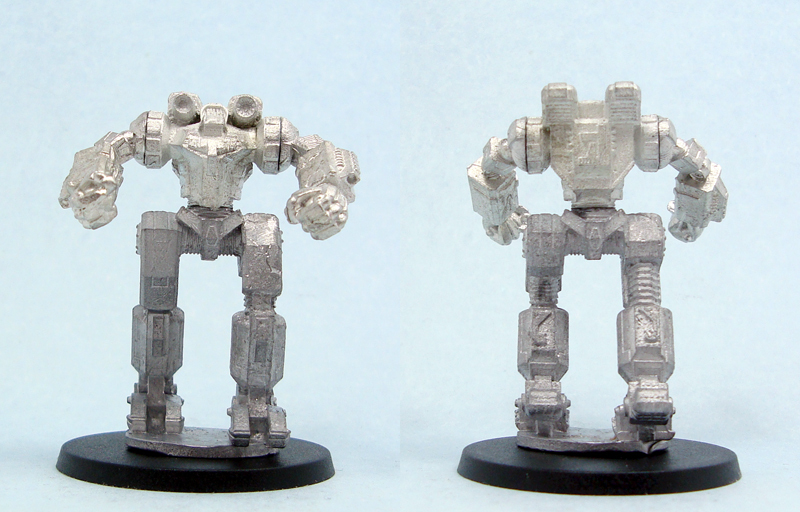 50mm tall, clunky, bulky and swinging two massive fists, Dauntless is definitely the Cherno Alpha of this group. In addition to the very heavily built legs, Dauntless has two cannons on its shoulders. 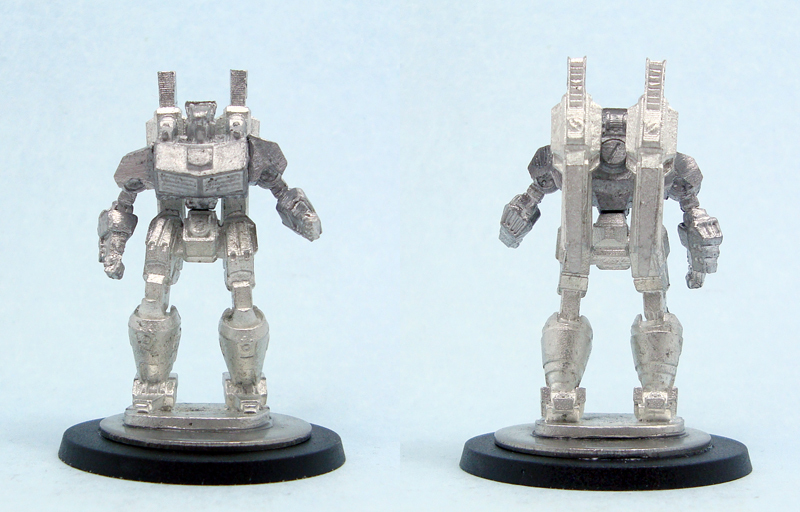 While the mech is only a few millimetres taller than the rest, it’s roughly 15mm wider than Hemi for example. You can really see the difference in the comparison pictures below. The size combined with the gorilla-like stance makes Dauntless look believably brutal. 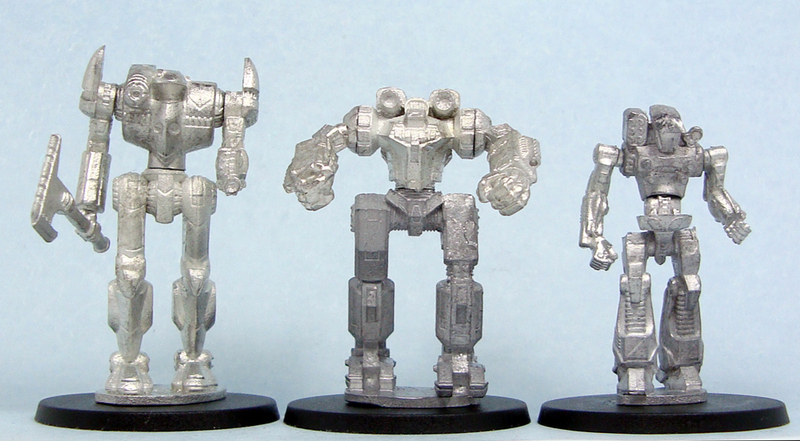 Waraxe is the tallest of the models reviewed, at a whopping 56mm. As the name suggests, the mech carries a large axe. No, seriously. It’s a giant robot wielding a giant axe. How’s that for awesome! In addition to its namesake axe, the robot has a shoulder cannon as well as another gun in its left hand, reminiscent of a tonfa (aka nightstick). It has a slimmer build than Dauntless, and to my eye it looks a lot like a cylon from the new edition of Battlestar Galactica. The shoulder guards on Waraxe bug me a little bit, as they’re completely flat on the inside lending them an unfinished look. Overall verdict: Well, these are some fine models. While writing the review I found it surprisingly difficult. Having never been into giant robots as a genre, I didn’t have many things to compare these to. I bought them for use in my Pacific Rim project, and for that they will be lovely as they’re a very characterful bunch. With good casting quality and nice sculpting, the main risk here would be boring designs for the robots, but that has been avoided here. Well ok, Hawk is a little boring, but he can be the exception to the rule. While I have a very specific use for the models, I can see them getting use in plenty of contexts and scales, so if you’re looking for some nice giant robots, you could do far worse than these. 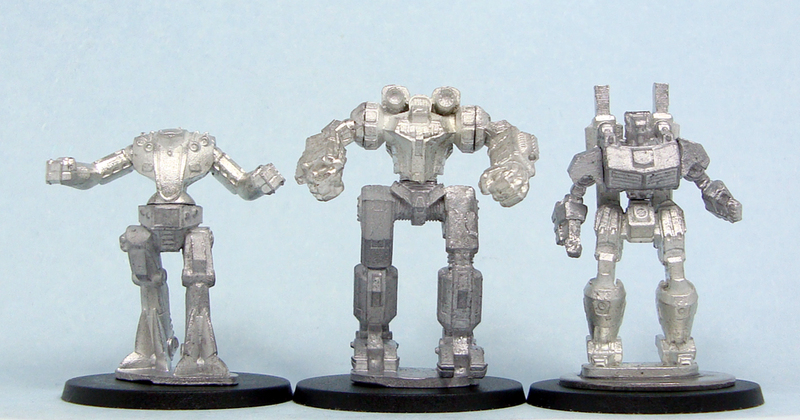 The comparison pictures show the size of the mechs compared to each other. I also threw in some Pacific Rim Heroclix kaiju, as I figured there might be interest.